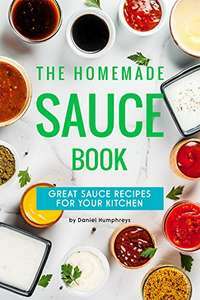 The Homemade Sauce Book is a collection of 30 great recipes to inspire you to cook meals and dishes from scratch. Whether you are creating sweet or savory dishes, dips, toppings, low fat or full fat, this recipe book provides both well-known traditional favorites and some new ideas for you to cook up a storm with. Simple ingredients can be transformed by a sauce and many can be made from store cupboard essentials. Inexpensive and full of flavor, these sauces will make your kitchen a homemade one, so grab yourself a spoon. anything free gets heat from me. Ooooh saucy ‌ Kumquat Sauce? Hot, but be warned it's sticks of butter and cups of things.